Nortek Security & Control (NSC) has announced that it is now shipping the new 2GIG Water Leak Detector, which is, according to the company, the first sensor to provide dual-source protection against water leaks and flooding. 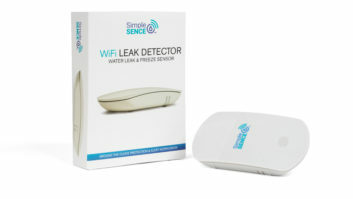 The patent-pending 2GIG Water Leak Detector alerts the homeowner of a leak before costly water damage or flooding has a chance to occur. The sensor, when placed under a water source, will send notifications to a homeowner’s smartphone or security panel if it detects either drips or pooled water. Transmitting wirelessly at 345 MHz and compatible with 2GIG and Honeywell systems, the simple installation requires no tools. Like the recently introduced Stove & Grill Guard, the Water Leak Detector is part of the new 2GIG Notification Sensors line, which adds multiple touch points to the 2GIG system and allows dealers to personalize security system features, improving customer satisfaction and retention.